When I was growing up in Japan in the 1980s and 90s, eating sushi was reserved for when you were entertaining important guests or celebratory occasions. It was rare to have it once a month let alone on a weekly basis, as it is consumed by many today. Since those innocent days, and subsequent travels abroad, I too have grown accustomed to devouring pre-made sushi at the local supermarket in the United States. Back in Tokyo with my friends, if we are hungry for something quick and cheap nothing satisfies us like the local kaitenzushi — fast food style sushi that circulates through the restaurant on a conveyor belt for diners to choose and serve themselves. In fact, I admit that with the heaps of affordable sushi readily available, I partake much more often than I ever would venture into higher-end sushi restaurants. Filmmaker Mark Hall, an avid sushi lover, realized how far the taste for sushi had spread when he came across sushi restaurants in Poland back in 2004. A few years later, he set out to produce and direct a documentary film entitled Sushi: The Global Catch that is currently making its way through the international film festival circuit. The film is both a love story about the artistry, history and culture of sushi; a documentation of the global expansion of the sushi industry; and a lament for its inevitable loss (particularly of bluefin tuna) due to our insatiable global appetite for it. This film serves as a reminder that we should be thinking about our consumption habits of the oceans’ gifts. What choices can we make to ensure that we can continue to enjoy these gifts in the future? Do we stop eating sushi immediately? Or are there alternatives being developed right now? While this film is not a Michael Moore style one man crusade to save the bluefin tuna, yet there is no question that Hall feels that the only way we can continue to enjoy this Japanese delicacy is by creating awareness of the complexity of issues surrounding it. In the film, Hall interviews Japanese fishermen, top sushi chefs, the CEOs of fish processing companies, and Casson Trenor, owner of a sustainable sushi shop in San Francisco. The film also takes us to Australia to interview Hagen Stehr a pioneer in tuna harvesting, and Alistair Douglas from a subsidiary of Australian farm fishing company Sekol. We have discussed and debated several times here at Our World about the alarming rate of disappearance of not only bluefin tuna but of other fish in the ocean, and this film gives audiences a chance to get closer to the issue without stepping into a fishmarket. We had the opportunity to interview the director, Mark Hall about his journey in making the film. Megumi Nishikura (MN): When did you first eat sushi? Mark Hall (MH): I was in my mid-20s when I first tried sushi. Growing up I had not much exposure to Japanese food — and do not remember sushi at a restaurant until I was in college. It was only when I was in graduate school that I mustered enough confidence to try ‘raw fish’. At the time, I had been invited to study in Japan by MITI [Ministry of International Trade and Industry, which became the Ministry of Economy, Trade and Industry in 2001], which gave me a scholarship. My very sophisticated New Yorker girlfriend took me to have sushi so that I would have ‘no fear’ of this cuisine when I lived in Japan. I loved sushi from the beginning — I can’t believe it took me so long to try it. These days I see American kids — as young as 3 or 4 years old — that are avid sushi eaters. MN: What motivated you to embark on the film? MH: In 2004-05, I was working in Poland with an organic agricultural cooperative. I was at a meeting at the Ministry of Agriculture in Warsaw one morning. The meeting lasted until lunch. I asked the people at the meeting if they might want to have lunch. Both of the gentlemen were over 65 years old, I would guess, and had lived through the USSR years when very little food arrived from outside Poland. I expected that we would go to the café on the corner that served Polish food, but both men wanted sushi! I ran into many other Polish people in Warsaw that loved sushi. There were 24-25 sushi restaurants that opened in Warsaw. This meeting struck me as to how sushi has become a ‘global cuisine’. It is very representative of the globalization our economies have experienced in the past 30 years — basically the same period that sushi first ‘landed’ in Southern California and over 3 decades is nearly worldwide. We ended up shooting a short segment about Polish sushi as a homage to the ‘epiphany’ I had in Poland. MN: Were you aware prior to making this film about the severity of the problem? MH: No, when I first started the project in late 2007 (our first shoot was in Tokyo in March 2008) I did not realize how big a problem overfishing had become as a result of the popularity of sushi. As we interviewed more and more marine biologists I became aware of how sushi’s popularity was linked to overfishing of some species of popular sushi-grade fish. The growing consumption of sushi in China was also something that I found fascinating and alarming. I also had thought — as far back as my days eating sushi in Poland — that there must be a heavy carbon footprint for transporting sushi-grade fish around the world. MN: What discoveries did you make along the way? MH: Many discoveries! Sushi is a complex cuisine with much tradition. I guess the ‘language’ of sushi — that particular vernacular used by sushi itamae [specialists or chefs] in their restaurants was interesting to me. Words like “murasaki” [literally ‘purple’, used in sushi restaurants by chefs to mean ‘soy sauce], “gari” [pickled ginger served with sushi] and other terms. I think the Japanese traditional apprenticeship is very interesting. Especially since in North America and Europe, anyone can call themselves a ‘sushi chef’ with little or no training. I think the Japanese system makes sushi more sustainable in that not everyone can call themselves a chef when preparing sushi. Perhaps this helps a bit in reducing consumption. MN: Was there anything in the film you wish you had included but didn’t? I.e., were there other possible solutions to overfishing tuna, if so what were they and why did you chose not to include them? MH: I regret not having shot footage in China about the rising consumption of sushi there, but our budget did not allow it. I would have also liked to interview someone from Kinki University in Japan about their technological advancements in the growth of higher-level fish such as tuna. Sushi is a rich subject — I could have shot footage for several more years! I think the three possible ‘futures’ of sushi — such as consumer education (Seafood Watch’s iPhone application), direct action (Greenpeace) and the technological ‘miracle’ (the Australian bluefin tuna ‘lab’) — were the possible solutions to the disappearance of sushi as we know it through overfishing of high level fish species such as tuna. MN: What impact do you hope this film will have on the average sushi consumer? MH: I hope that sushi lovers around the world might have a better appreciation for how the fish they eat arrives at their table — and that we may start experiencing extinction of certain species of fish for sushi if we continue on the current path — and not choose fish that are less threatened by overfishing. I hope also that people outside of Japan will have a great appreciation for the traditions of the cuisine. MN: The film “End of the Line” is also about the depletion of fish from our oceans, how is your film different or how does it add to the argument about preserving the fish in our oceans? MH: I first learned of “End of the Line” from Barbara Block while shooting in Australia in March 2009. It was a very good film but the path I chose for “Sushi: The Global Catch” was more about a food (i.e., sushi) that has experienced global popularity leading to unintended consequences (overfishing, cultural dilution). Audiences that have seen my film expressed much concern about the ecological unintended consequences of sushi’s growth — many of these people, sushi lovers for sure, had no idea of the problem. MN: Are you planning to show this film in Japan? What do you hope that the impact is there? 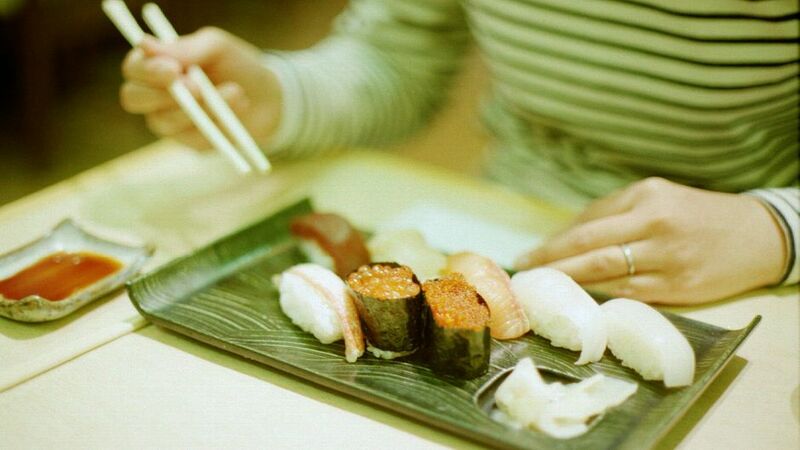 As sushi is a Japanese cuisine, should Japanese take more responsibility? If yes, how so? MH: I hope that the film is shown in Japan. We have entered one of the leading festivals, the Tokyo International Film Festival, with hopes that it will be accepted into their program. But I hope the film might be screened in Asia, the Americas, Europe — basically wherever there is sushi. And I don’t believe the Japanese people have a special responsibility to cure any of the unintended consequences due to the global growth of sushi as a cuisine. Japan gave us this delicious food — and it is up to all of us to take responsibility so sushi can be enjoyed by generations of people worldwide in the years to come. The World Loves Sushi… Too Much by Megumi Nishikura is licensed under a Creative Commons Attribution-NonCommercial-ShareAlike 3.0 Unported License. This is fascinating and educational. I am so impressed with the information and looking forward to see the film. As consumer, it is our obligation to find out where and how our food arrived to our table , as well as it’s impact on aquaculture. In Japan, the media rarely take up about overfishing, because there are many fishers and fishing industries have bold influence. Japanese people innocently glad of spreading sushi culture over the world. But like this article, we have to remind that sushi must be a luxury food. There are many challenges to finding sustainable solutions. It is not just the sustainability of the target species but also the eco- and social-sustainability issues that need to be considered and addressed. Trying to fix one component in isolation will have limited success. Ignoring that fisherman in Indonesia are sometimes held captive on boats, have a choice between killing a tuna or seeing their wives on the streets needs to be addressed – along with the corrupt politicians and bureaucrats that take bribes. It is daunting. The only way these issues can be addressed is for sustainable solutions to be profitable and equitable. Consumers need to demand to know which fisherman, which boat the fish came from, and that the people on that boat are getting their fair share of the profits coming from their pockets. Overfishing is as much about addressing social issues as it is about making sure that only what is taken each year is replenished each year.